A couple of weeks ago it was J's sisters birthday and we had just watched too many episodes of Ace Of Cakes. Now I have to admit I watch this show and spend half the time thinking - "now THAT doesn't look too hard" (for the record there are a lot of things they do that I think DO look hard!) 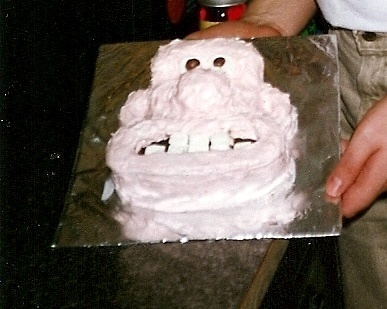 so it seemed very logical that we should try to make a cake that looked like something. 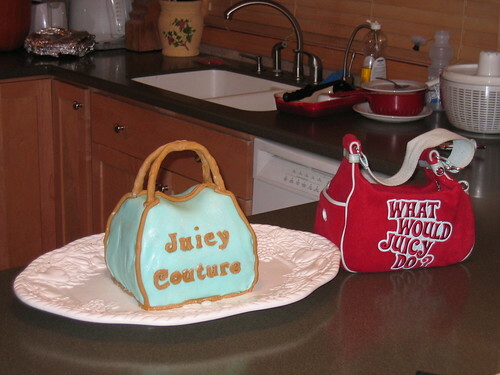 Two of the most obvious things that come to mind about J's sister are Boston Terriers and Juicy Couture, especially their purses. It didn't take long to realise that a purse was going to be a LOT easier than a Boston (maybe next year!). Pretty darn good I think.... and its a lot of fun. Maybe Duff will see this and offer me a job! Of course now I have to come up with something special for J's birthday - its got to be better than her sisters right! Now I admit this isn't quite my first time... 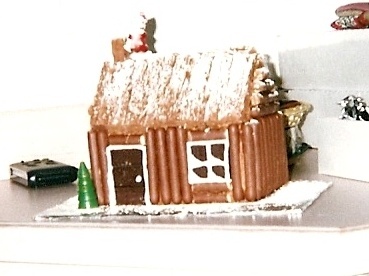 I have dabbled in the culinary arts over the years - usually to impress a woman (for some reason they don't expect a guy can make a cake let alone decorate it!). So I dug up some old pictures - some of these took a lot of time, some were knocked together pretty quickly. 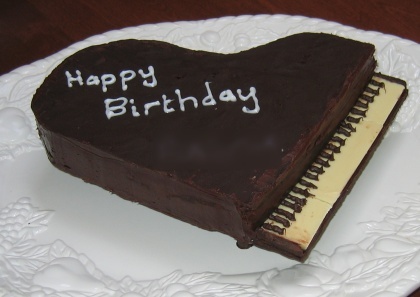 This piano has chocolate legs, with a chocolate base and top and of course chocolate cake in the middle. The keyboard is (of course) white chocolate. A purple truck... long story but someone had a purple truck which was perfect Barney color so all of his friends called it the Barney truck. 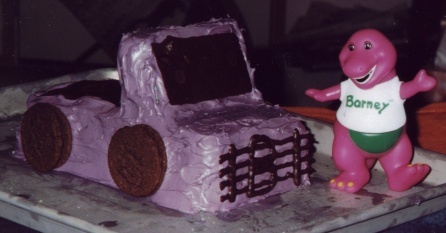 The cake was in honor of that truck. Oreo wheels!!! Tell the truth Maxim magazine - you messed up big time! Back in the midst of the .com boom of the late 90s the internet was a truly wonderful place to visit for cheapskates like me. Everyone was offering 20% off coupons, people had pricing mistakes every week because they hired their nephew to do their eCommerce site and there was as much free stuff as you wanted. There were so many of these offers that it became a big joke to sign up for as many as possible and watch expiry date grow. Once the meltdown had ended and the offers disappeared I had Stuff until 2019, Maxim until 2014 and FHM till 2012. It did cross my mind that this was a lot of free stuff to give away but companies this size surely hire smart marketing people who know what they are doing - right? Well early this year my FHM stopped being delivered.. I didn't really notice for several months when I got notice that Stuff too was being cancelled. Now if they had bothered to contact me and say something like "Hey man we blew it - we spent so much money on marketing and giving away free subscriptions that we have to close down" then I wouldn't have thought twice. But I doubt that anyone at FHM or stuff went without and probably got a lot of free booze that I never saw any of. So I emailed them - well I tried, you see they have pretty much disappeared off the face of the earth. Web pages are either gone or just don't load. The phone numbers go unanswered. Eventually after several attempts I got answers from FHM and Stuff. FHM said I should have got switched to Esquire or ESPN - not that I desire either but heck its just something to read in the crapper! I've never got either and I just sent them another email. Stuff said they would switch me to Blender or....... yes you guessed it Maxim. So given that I have 12 years left on Stuff I fully expected to get a Maxim that had 2026 on the label....instead today I got 6 identical letters telling me that Maxim have rejected my subscription extension due to their 'new' 5 year subscription term. The 6 letters have a total of 7 year years and 5 months of issues between them. The letters tell me to call " - - " or write to " , , , , , ". (yes that's exactly how its printed) to talk to the 'selling agent' if I don't get a refund in the next 45-60 days. So finally they realised their mistake - they realised that offering free magazine subscriptions is a dumb business model unless you limit it. Not only do you have to eat the costs but when other magazines in your empire go under you also have to eat their subscriptions. But did Maxim tell me this? No they just set an arbitrary limit and then rejected the transfer. Bear in mind that Maxim and Stuff are both published by the same publisher so they actually just rejected an internal request! So I'm wondering if somehow this will ripple back to Stuff and someone will issue me a refund check for a magazine I never paid for in the first place or if this is all part of the plan to dig them out of the hole they created by handing out too many free subscriptions. I suppose asking a business to be honest about their screw ups is just too much to expect. But I feel like I shouldn't give up - I gave up something - an email address at the very least - to a company who had been offered very cheap or free subscriptions by a large international company as part of a marketing campaign. Its really not my problem that the 'fresh out of college' MBA that you hired at minimum wage didn't think that people would collect them like Beanie Babies. A smart company would have just said 'one free subscription per household' and that would have been the end of it. But you didn't and now you need to honour your commitment or go bankrupt trying.... removing web pages and shutting off email addressed won't work because you are all part of a huge publishing company that can easily be contacted. And yes I *AM* just doing this for the sport now.... some people hunt, some people do yoga, some people swing - The ZMan chases up idiot companies for relaxation! I just got back from a great weekend in Leavenworth, WA where I did several of my favourite things - I ran a half marathon and I drank lots of beer. As for the farting well you will have to read on. My plan for the half marathon was to take things fairly easy. Its my first long race since the Vegas marathon last December due to a slight injury I had earlier in the year. Well the injury hasn't gone away 100% but either a) Its gone away enough to run on -or- b) My pain tolerance has gone up enough that I don't feel it as much any more. So I've been slowly ramping up my distances aiming for some bigger races later this year and early 2008. Coach N has been trying to crush my spirits with killer track workouts (which I apparently whine far too much about!) and I've been doing really well on the long runs over the weekends. But I've not really tested the legs fast over this distance for a while and I do have a full marathon in 6 weeks so it made sense not to push it. My PR of 2:00:14 from Mercer Island 18 months ago was looking pretty safe. The Leavenworth course starts with the only major hill of the race. Its not too steep for the first 2 miles but the last 1/4mile is a little challenging. I tried to be good and start slowly but got dragged along with the pack and clocked 8:32 for the first mile.... not good when I was estimating 9:30 pace for the race at best (around 2:05 final time). So I tried to slow down for the second mile which was easy as the hill was getting steeper... but 9:08 was still faster than i wanted. I was, as always, entertained by a couple of people who think its socially acceptable to fart as loudly as possible while in a big pack of runners. Then the steep bit hit and showing a little caution to my poor calf muscle I managed to back off, take a drink and turn around to head back down the hill.. only to find I ran 9:16. OK so I went out a bit fast... I can take it easy down the hill and see how I feel. An easy 8:21 and 8:55 back down for miles 4 and 5 wasn't surprising but I'm wondering if I should be concerned. I throw my vest to J who is doing a great job with the cowbells and realise that even with the hill out of the way I am under 9 minute pace which would be a PR if I can keep it up. My legs are feeling a bit tired though so I'm pretty sure that's an unreasonable goal to go for - I decide to blame a rather brutal track workout from over a week ago for the tiredness. Mile 6 seemed very long and tiring and people were passing me - a group of 5 deer crossed the road right in front of us all and looked about as confused as most non runners do when you tell them you are running 13.1 (or 26.2) miles 'for fun'. After a few minutes watching they headed off to munch goodies at the local golf course. Near the 6 mile mark one of my fellow runners was waiting to cheer and rather surprisingly I discovered I had run an 8:42. I'm starting to wonder what is going on here as people are still passing me and I am feeling tired but apparently I am not slowing down. Maybe the mile marker was bad I think. I totally miss the mile 7 marker so as my clock goes past 9:30 I think that maybe, just maybe I have found a more sensible pace. Then it passes 10:00 and 10:30 and I realise what has happened. I grab some water and as I start to run again I find myself behind the US farting champion. No kidding this guy is farting almost every time his left leg (yes his left I watched carefully) hit the ground. After 10 or 15 strides I am wondering where the gas is coming from but I reckon I need to be in front and pass him. Before I know it I am at mile 8 and while I have slowed slightly I have still run 2x8:55 and my total time is now over a minute faster than 9 minute pace. I start to think that maybe all those track workouts have been good for me - maybe I am fitter or maybe I learned to tolerate the fatigue better but either way I start to enjoy things more. I'm still pretty convinced that sub 9 pace is out of the question but I decide to keep plugging on and if I am still under 9 minute pace at the 10 mile marker I am going to go for it and try to PR. Mile 9 has a water stop at the bottom of a steep but short hill so almost everyone takes their water and walks the 30 yards or so before starting the downhill. This was the main contributor to my slowest mile of the race at 9:21 but I followed that with an 8:32 putting me 1 minute and 10 seconds ahead of PR pace and now I had to go for it as per my earlier deal with myself. By this point in a long race you are running with the people who will finish at a very similar pace. Some of them are people who went out fast and slowed and some have run an even race. But this has one good advantage its actually very easy to pass people since you only have to speed up a little bit. I've used this as a technique to speed up in other races - sometimes it works and sometimes you just don't have the energy but today things are going well. Around this point I find farting guy again (though I don't remember him passing me) who thankfully is out of gas and pass him along with quite a few other people. I'm counting off the miles and things are feeling a little harder but amazingly I'm holding a great pace. Somehow I miss the 11 mile marker but did approx 2x8:35 followed by an 8:16 for mile 13 and 40 seconds for the final .1 mile (yes folks that's sub 7:00 pace!!!) for a final time of 1:55:02. After a soak in the river - man THAT was cold - and a shower it was off for some celebratory beers. For some reason Leavenworth thinks I should pay $10 entry to get into the Oktoberfest and buy their promotional trinkets and probably pay extra for the beer. So we spent the $10 on beer instead and drank in a non Octoberfest venue that sold perfectly good German beer. In fact it was so good we drank quite a lot and I may have told the farting marathon runner story in a VERY loud voice... for anyone sitting near me I am very, very sorry. Finally to end a great weekend we went to the best cheese shop in Washington, the (formerly) best bacon shop in Washington (sorry Willi but your bacon has gone the way of most US bacon - 80% fat so we didn't buy any today), a tour of Applets and Cotlets and on the way home popped into a roadside farm store for apples, cider and of course a pumpkin. How did it get so expensive on the last day??? Back when NetFlix was the only option in town I tried the free trial offer just like everyone else and watched more movies in 30 days than any sane person should and then like some people I cancelled. The pressure of watching enough movies per month to justify the fee was too much for my particular liking. So I used my local blockbuster store to rent the 1-3 movies per month at a schedule I liked. The store was 15 minutes walk so it was all convenient. Then they lost their lease to a bank that was prepared to pay higher rent (well so one of the neighbour businesses told me). Now the closest ones are a 15 minute drive each way - not so bad but caused me to go and look at blockbuster online and netflix. About that time WalMart cancelled their DVD rental scheme and converted their accounts to NetFlix. Blockbuster responded by offering some super deal to anybody who sent them a NetFlix cancellation email. They didn't seem to realise that a netflix cancellation mail was trivial to get by just signing up for the 30 day trial and then cancelling so I'm sure they got burned on that one. Once the offer was over I dutifully paid my $10+ per month and figured I was getting a good deal especially as the price of gas went up. The prices were similar to NetFlix but you got 2 coupons a month to use in the store while you waited for delivery which IMO gave them the edge. So I got about 2 DVDs a month in the mail and mostly used my coupons to get 2 more. Then they added the total access - where you can take the DVD back to the store and use that to get your free DVDs... they cut you down to one coupon which was reasonable. In a good month I would get 2 DVDs, exchange them for 2 more and use my coupon. 5 DVDs a month is pushing it for me and I started to feel some of the pressure so I looked to see if they had a lesser deal. To my disgust I found that at some point blockbuster had introduced a scheme without unlimited rentals. I was paying $10 a month for unlimited (and doing only 2 exchanges) and they had a scheme for $4.99 where you got exactly that deal. 2 DVDs by mail, 2 exchanges in store and 1 coupon to use at any other time. I was a bit annoyed that they hadn't bothered to tell me about this deal but like most big companies they realise that there is little profit in encouraging customer to a cheaper plan. So I switched - I was still using about the same number of DVDs but at $4.99 I didn't feel too guilty if I didn't use all 5 DVDs. Then a month or so ago I got an email telling me that blockbuster had scrapped the plan I was on and upgraded me to a new one. Oddly enough the new one was 30% more expensive (yes I know I'm only talking a couple dollars here but 30% is 30%), still limited me to 2 exchanges and got rid of the coupon. Nice! So for my extra 30% I get oe less rental per month. That's one hell of a upgrade. Its a shame really since they just added the one killer feature that I've been waiting for for over a year - automatic queue updating when you rent from a store. For example if I have 300 in my queue and I exchange in store then it will automatically realise that I've seen 300 and remove it from the queue. I understand prices go up, I understand that your profits are down since you had to stop charging late fees to compete with NetFlix but when you send me emails PLEASE quit sounding like you are doing me a favour. Charging 30% more and delivering less is not a good way to keep customers. Of course you have discovered like the cable company that most people are mindless sheep and they would rather not go through the bother of changing service provider once they have got a queue full of videos and, also like the cable company, you offer your best deals only to your new customers instead of to your oldest and best customers. Thanks for contacting BLOCKBUSTER Online Customer Care. I appreciate you taking the time to notify us of your concern, Andrew. Unfortunately, eCoupons are no longer available. We feel we are still delivering a great consumer value and encourage you continue with the new terms and rate or consider one of the new plans we offer. Dear Andy, We're really very sorry we had to change your service. However postage costs for shipping DVDs have gone up 15c per delivery and our staff got a very reasonable 5% pay raise this year. As a result the cost of your service has gone up by 6%. Dear Andy, We screwed up - we're really sorry. We thought that by offering a cheaper plan we would make up in in store purchases volume what we lost in profit margin. However it appears that our online rental customers are not actually buying any candy when they go to the store and as a result our revenue is down 10% for online rentals. We would like to give you the option of taking a 10% increase or reducing your service my losing your coupon. We hope you understand. 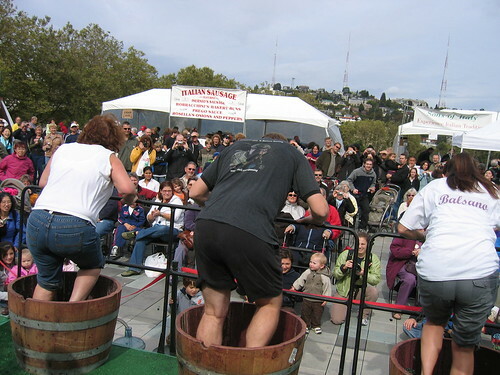 At some point during the 4 years I lived in Seattle I came across the Seattle Italian Festival and, more specifically, the Grape Stomping competition. For reasons long forgotten I never managed to remember or be in the right place at the right time an I never took part. Eventually I moved away from Seattle to the suburbs and forgot it even more. Then this year for some reason I managed to remembered to enter in time and the weekend happened to be free so myself, Steve and J headed down to Seattle Center on Saturday. The rules are pretty simple - 20lbs of grapes in a barrel - 3 people squishing for 1 minute each and then 1 minute to 'assist' the juice down the tube into the collecting container. 3 teams on stage at a time competing for the prize. You would think with all the marathons and triathlons under my belt 1 minute of squishing would be child's play. Well it wasn't - I went off far too fast and was in danger of having to stop and rest when they started my 10 second countdown. I think by the time I was done the barrel was 70% juice and after J was through poor Steve was searching for the last few grapes to squish. For the final minute we lucked into what appeared to be a very optimum technique (based on watching people who went after us). J went below the stage and shook the tube (which blocks very easily), Steve lifted the barrel and I stuck both arms in past my elbows and 'swirled'. Initially I tried swirling the solid matter out of the way in the hope that it would drain faster but there really was no way to keep the skins and other gunk out of the tube. So I resorted to using pressure to force stuff down the tube and relied on J to unblock it. This worked very well until I knocked the tube out of the barrel. At the end each team had to hold up their juice for the audience to decide the winner. The emcee tried to convince everyone that it was close but judging by the cheer that went up we were way ahead. It probably didn't hurt that we were also the messiest and I used the charm of my British accent to make all the little old ladies vote for me. We got a nice bottle of wine each which will help fill my new present to myself that should arrive this week.